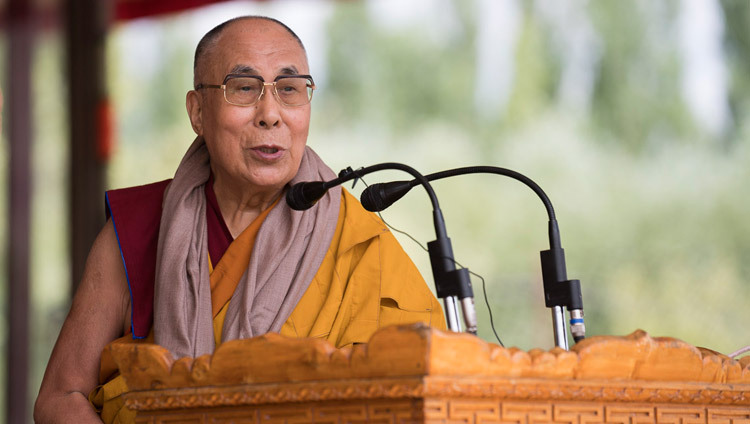 Leh, Ladakh, J&K, India – Substantial rain yesterday evening that left large patches of the Shiwatsel teaching ground waterlogged seemed to have done little to dissuade devotees from attending the third and final day of His Holiness the Dalai Lama’s public teachings in Leh. The organizers, the Ladakh Buddhist Association (LBA) estimated that 60,000 turned out. As soon as His Holiness sat down after greeting the crowd, he was called upon to release a book documenting his visits to Ladakh over the last 50 years by Tsering Sonam from Sasphol. “Today is the third and concluding day of our public teachings,” he declared. “First of all I’ll finish reading Chapter 6 of ‘Guide to the Bodhisattva’s Way of Life’. Then I’ll give a White Tara Long-Life Empowerment, following which a Long-Life Offering will be presented to me. In this case, disciples should make prayers and the Lama will pray too. Because of the spiritual bond between the two, much like that between children and parents, Kadampa Geshe Potowa said the prayers may be effective. Resuming his reading of Shantideva’s text, His Holiness remarked that although we may pursue the eight worldly concerns, they do not bring us much benefit. The most important factor in our pursuit of enlightenment, however, is the cultivation of compassion. The biggest obstacle to that is anger, but patience, the subject of this chapter, acts as a counter force to that. The verses he read made the point that when it comes to the causes of enlightenment, while half can be attributed to the Buddhas, the other half is attributed to sentient beings. If we revere the Buddhas, should we not equally revere sentient beings too? His Holiness paused to advise those sitting out in the hot sun, particularly the monastics, to cover their heads. Once again he called on the students from classes 6, 7 & 8 at SOS Tibetan Children’s Village and Ladakh Public School, who had been energetically debating prior to the teaching, to come up and sit around the throne. Returning to the text, he asked what Buddhas and Bodhisattvas will think, since they are dedicated to the welfare of sentient being, if we neglect and abuse those very beings. The author’s response is to pledge—From now on, in order to delight the Tathagatas, I shall serve the universe and definitely cease (to cause harm). “Mind has a relation to the brain, but its nature is an experience of knowing—of clarity and awareness,” His Holiness continued. “The fundamental cause of the omniscient wisdom of a Buddha is the mind of clarity and awareness we each have within us. This is revealed as we eliminate the obstacles to knowledge. It is this luminous state of mind, referred to as Buddha-nature, that continues all the way to Buddhahood. As well as glory, renown and happiness in this very life All come from pleasing sentient beings’ reminded His Holiness of Gandhi. Because he was dedicated to the people of India, despite being very poorly dressed, millions were devoted to him. His Holiness put down the text and turned directly to the procedures for the permission for the practice of longevity associated with White Tara. In offering an opportunity for those interested to take the vows of laymen and laywomen, he explained the role of the four kinds of Sangha members in the categorization of a ‘Central Land’. One definition is geographical; another relates to the presence of the Bhikshus and Bhikshunis, fully ordained monks and nuns, as well laymen and laywomen keeping precepts. His Holiness observed that the tradition of Bhikshuni ordination was not spread in Tibet, although it was propagated in China. As part of the ceremony he also gave the bodhisattva vows. At the end of the empowerment he gave transmission of the mantras of the Buddha, the bodhisattva Avalokiteshvara, noting his close connection with the people of Tibet and the Himalayan Region, Manjushri, and Arya Tara. While giving the Hayagriva mantra, he remarked that it would help people who find themselves going into trance as a result of spirit possession. Monks accomplished the Offering of a Long-Life ceremony to His Holiness. Supporters of the LBA took part in the procession of offerings, bearing images and religious symbols, scriptures, sacks of grain and bundles of brocade. Local horn players and drummers played. As they passed in front of His Holiness, men and women doffed their hats. Before the ritual was quite complete, J&K Chief Minister, Smt Mehbooba Mufti Sayeed arrived. She offered His Holiness a traditional shawl and he gave her a white silk scarf in return. Addressing the gathering, Tsewang Thinles, LBA President paid his respects to His Holiness, Thiksey Rinpoche and Thuksey Rinpoche and welcomed the Honourable Chief Minister. He remarked that at a time when intolerance and religious extremism thrives elsewhere, leaving people yearning for peace, the people of Ladakh are fortunate to have His Holiness visit year after year. He stressed how much people here value his advice in addition to his Buddhist teachings. 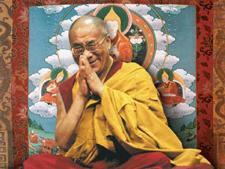 He expressed hopes and prayers that His Holiness will return again in coming years. “Many of the problems we face today are of our own making. We need to take a broader perspective, not sheltering behind narrow-mindedness and short-sightedness. If, for example, we developed a deeper sense of the oneness of humanity, many of our difficulties would be resolved. After the Chief Minister had left the stage, His Holiness returned to the Shiwatsel Phodrang and many in the crowd began to disperse. Others remained to picnic in the shade of large umbrellas.